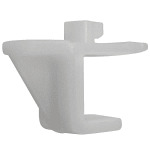 The Turbo Air P993200800 shelf clip supports shelving in Turbo Air refrigerators and freezers. It can be used to replace old or broken clips, or to add storage. The Turbo Air P993200800 shelf clip snaps into place for easy installation.